In February I had the priviledge to attend the Movers and Makers Summit, held in Charleston, SC. It is a retreat, of sorts, for entrepreneurs. There were keynote speakers that shared their expertise on many subjects, including how to stay the course in your business, market successfully, and how to take care of yourself while doing so. This is the amazing group of women that attended the summit. Speakers included my daughter, Bonnie Christine (pink blouse, front row), and Lisa Jacobs, Paige French, Kerri Burki and April Bowles. The rest of us just sat back in the beautiful house by the seaside and centered in on the reason we were there. That's me, far right with eyeglasses. One special attendee was Nalana Lillie, pictured above on the back row in the black and white stripe blouse. Nalana is a blogger and candle maker, presenting each with a special story presentation. For the month of May, Nalana is featuring Mother and Daughter relationships and entrepreneurship on her blog. 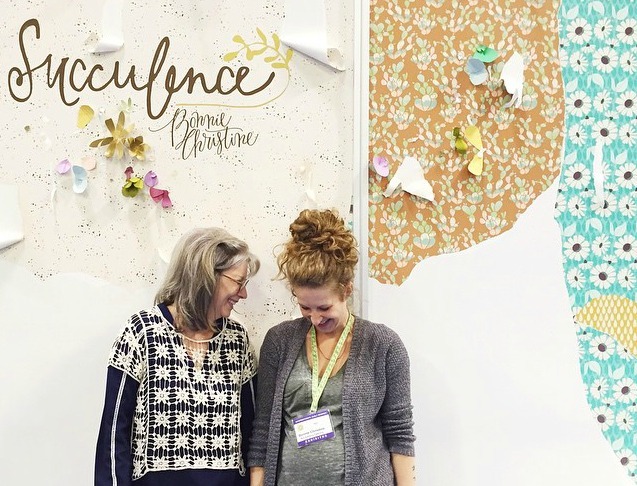 I was so excited when she asked to interview Bonnie and me for a post! I have to say that working with Bonnie is, well, just fun! To read more about how Bonnie and I support each other, read Nalana's article, as well as the other featured posts on Mother and Daughter pairs. Bonnie and me, exhausted after breaking down our booth at International Quilt Market last week.